What does the world envy about Italy? Its beauty, taste, savoir-faire – those rare, valuable gifts that still win hearts and fuel desire. 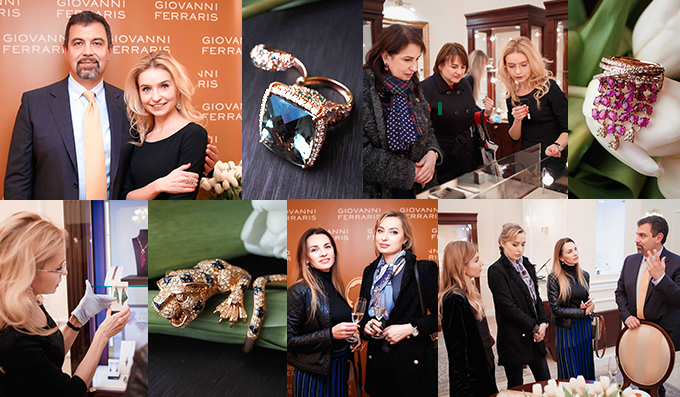 We had proof again in Dnipro and Kharkov, two cities in Ukraine: at jewellery shops Cellini and Il Cammeo Giovanni Ferraris presented the new 2018 collections introduced at Baselworld. These two events brought to the boutiques the spirit of a jewellery rich in ideas, inspiration, creative flair, and colours. Kaleidoscopic, imaginative, stunning. The guest appreciated being the first in the world to look at a collection of skills and fresh thinking. ‘It is because of you, Giovanni Ferraris, and your work that our customers are the most beautiful,’ is the rewarding compliment from Irina Omelchenko, who directed the two events.